Eine Liga f�r jeden Geschmack?! Analog zur Vintage Super League hat Randy Buehler nun die Standard Super League (kurz: SSL) angek�ndigt. Sie soll jeweils in der Pause zwischen zwei Vintage Super League-Saisons abgehalten und so f�r ein "ununterbrochenes" w�chentliches Programm sorgen! Wie ist Deine Meinung dazu? Ist das Unterfangen eine sinnvolle Erg�nzung oder so �berfl�ssig wie eine juckende Pobacke? Doch zuvor wird es im April noch Suspension Field und Abzan Beastmaster im Mai im geben. 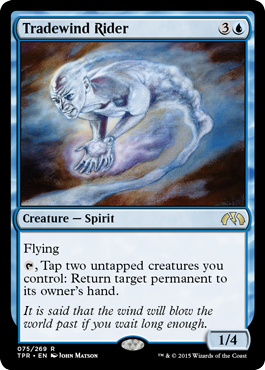 WotC h�tte sich f�r die Pr�sentation des Online-Set Tempest Remastered ja richtig Zeit nehmen k�nnen. Nicht, dass die Karten ein Geheimnis gewesen w�ren; aber die f�r die Enth�llung, welche der 621 Karten des Rath Cycles online neu aufgelegt werden, h�tte man doch einigen Aufwand betreiben k�nnen, oder? Nach meinem ersten �berfliegen der Karten hatte ich den Eindruck, dass es sich dabei um ein typische Cube-Zusammenstellung handeln m�sse! Doch auch wenn dieser Eindruck tr�gerisch sein sollte, so schaut das Set doch nach einem extrem geilen Draft-Erlebnis aus! Would you by any chance be coming to Pittsburgh Grand Prix this year? And (long shot) would you be privy to other artists that may come as well? [+]I don?t have it planned.� My schedule is mostly filled until December?but stuff always happens. I don't know if you answered this or not already but are you going to gp las vegas? [+]Generally, yes.� In the near future that will be tough since I will be traveling until mid May?.I won?t be able to get mail. Any chance you'll be at ECCC? [+]Sorry, didn?t make it this year..I was off in Richmond. is there any way to get commission work from you without going to an event or convention? [+]Just tokens at this point.� They are on my website. [+] stop-social-justice-harassment:perilinkle:Art by: Robotmichelle�(Hang in there, Michelle)ARE YOU KIDDING ME.�I DIDN?T EVEN KNOW ABOUT THE GIL PICTURE.WHY DIDN?T PEOPLE COMPLAIN ABOUT THAT AS WELL? Western social justice people are really wired. [+]kristaferanka:Finally announced! ill be drawing House of M this summer! ?Namor fans can also thank Mr. Anka for the Sub-Mariner?s role in the book. Kris?s first list of potential characters consisted of the word NAMOR in 20-point font.? - Dennis Hopeless !!!!! [+]markrosewater: Shawn Main?s friend, Mel Li, made him a birthday cake. I took a picture of it before it got flipped. [+]This is a StarCityGames.com Premium Article. Click here to sign up.GerryT knows a lot about how to understand formats, and he's seeing a few things in the metagame many are not! See what his plans would be in both of the big Open Series formats heading into #SCGNY! 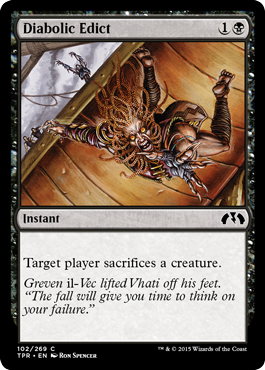 [+]GerryT has seen some strange Modern decks in his travels, but this one belongs among the most bizarre! 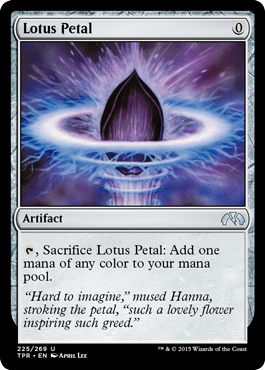 If you want something different for the $5,000 Premier IQ at #SCGNY, you've come to the right place! 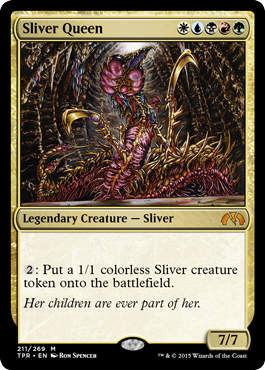 [+]Abe Sargent plays as much Commander as anyone, and when he speaks about the biggest shift in the format in years, it would do us all good to listen up! 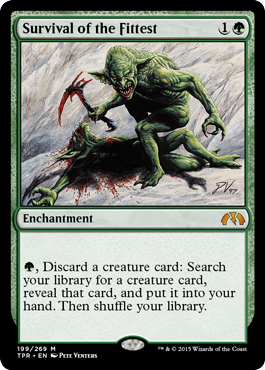 [+]The number of Goblins in Magic is exceeded only by the crazy amount of things you can do with them. See what Jess Stirba is doing with them in this week's shenanigans-infused Dear Azami! [+]Matt Higgs cannot lie. 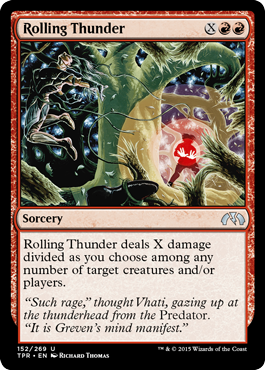 He is assaulting Standard with a host of new brews that all feature giant tushies slamming into the red zone Doran-style! #SCGNY is as good a place as any to show your toughness! [+]This is a StarCityGames.com Premium Article. Click here to sign up.Pro Tour Champion Ari Lax understands formats like few others, and today he's giving you an incredible new way to look at Standard! Let Ari help you at #SCGNY and all events beyond in this great theory piece! 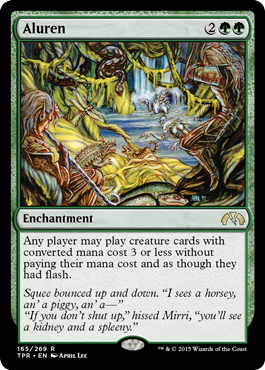 Why doesn't Servant of the Scale have modular for creatures? 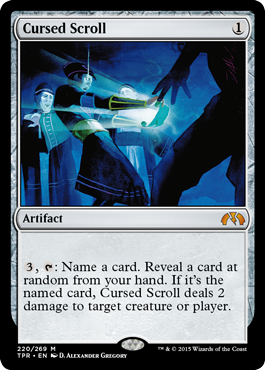 [+]Good question, especially when you consider how often modular for creatures appears in other sets. What were your thoughts on Wrestlemania and post mania Raw? I'm sure you have some fun things planned today. [+]Going to work. Yay. Then trivia tonight if I feel up for it. You becoming black-bordered rules manager or me becoming silver-bordered rules manager? 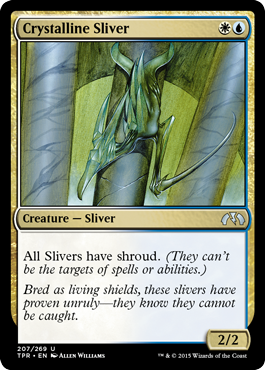 [+]You becoming silver-bordered Rules Manager.Of course, if I really wanted to kill the game? [+]wizardsmagic: Look at Me, I?m the DCI - Mark Rosewater My artistic work is finally being recognized. [+]wizardsmagic:Here?s a pronunciation guide for some of the names that were requested earlier today. List of all names is after the cut!Read More In case some of you missed this. Well I have to say I'm impressed. How exactly did you manage to make time for writing all of that? [+]It?s what clones are for.�: )In all seriousness (really today? ), other than the commentary in the Arcana, all of today?s site was done by other people. The commentary track on your DtW boxed set is something else. [+]: )�I had fun with it. What is the most likely plane to return to? Don't say zendikar. [+]"What?s two plus two? Don?t say four. 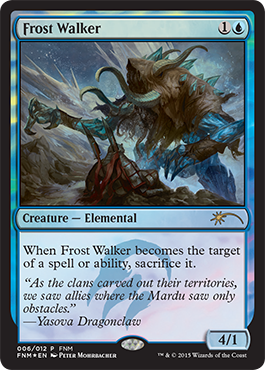 "�: )I wasn?t going to say Zendikar for Battle for Zendikar. 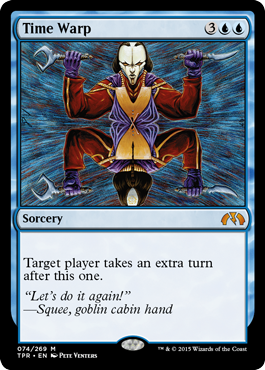 I was saying it because it?s Nissa?s home plane which means we?ll visit it in Magic Origins. Someone brought up Yawgmoth earlier. Is there any official word on the state of him? Is he actually dead dead? do you actually like cake? Is the fact that you dont like embedding mechanics within mechanics why unblockable is no longer a keyword? [+]It was never a keyword. The reason it didn?t become one is there are so many conditional unblockable creatures. 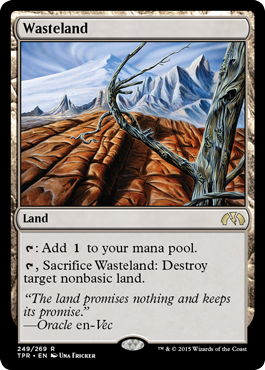 Are you allowed to tell us what stage of design Battle for Zendikar is in? If not, what is your favourite kind of cake? [+]Battle for Zendikar is all done on the R&D end. "Ninjas vs Pirates" duel deck or "Cats vs Dogs" duel deck? [+]Ninjas vs. Pirates.�: )And that brings is to the end of this version of ?Which Would Come a First? ?Thanks for playing. [+]It was an inside joke about a former Wizards employee named Steve Bishop. Return to Rabiah or Return to Rath? [+]Return to Rabiah (because Rath is gone, overlaid on Dominaria). You've mentioned it a few times, so I thought I'd ask. How often do multiple designers come in with the same designs from homework? [+]It happens all the time. Barry's land or Sixth color? So I can?t use that leg anymore. [+]So I can?t use that leg anymore. [+]Tickette and Arthella of the CityI know. �I know. �I never claimed to be normal. Starscream of the DecepticonsYep. �This really happened. [+]Starscream of the DecepticonsYep. �This really happened. Mark sent me here to get this question answered, Can we have a red "act of treason" but have the flavor be about love/passion for the opposing side created by the spell? Why does the person in Myth Realized have the Jeskai symbol on his forehead, especially considering Ojutai made all knowledge of the Khans and the Khanfall forbidden knowledge? [+]April Fools! No prank is a prank without severe, lasting trauma! [+]First shot at a non mini Narset. I don?t know how I feel about it, mostly just trying to work out how she would fit in with my drawing style. [+]Seth takes a look at the Standard deck he went an impressive 6-2 with at the SCG Invitational: Red/Green Dragons! 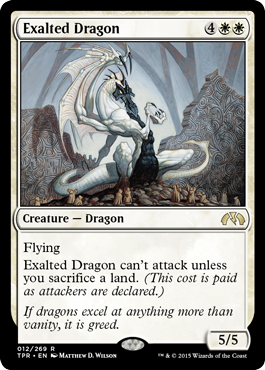 Find out how many dragons is enough as he tries out some of the newest Dragons of Tarkir cards to great success. 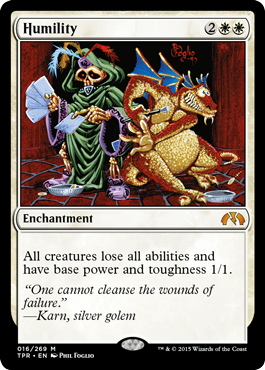 [+]Adam shares his pick for the best deck in Standard - GW Devotion - and explains how Dragons of Tarkir makes it even better. Gain insight into Adam's deck-tuning process, and don't miss his updated decklist! [+]This past weekend played host to the Second Annual Hunter Burton Memorial Magic Open. With a strong turnout, Jeff goes over some of the top strategies players were implementing at the event and what Standard currently looks like. [+]The thing that has impressed me most about Tumblr’s April Fools joke this year is that it also carries over onto the mobile app. I was not expecting that! Well done, Tumblr. Well done. I love this Executive Suite thing! [+]I love this Executive Suite thing! 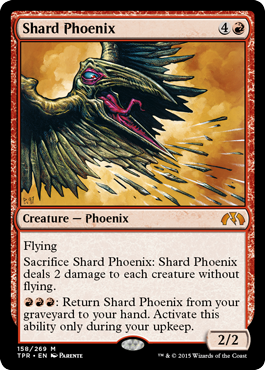 Ensnaring Cambridge?Is Skred Red a Real Deck? [+]Looks like we?re getting a Standard Super Leageu to watch so it?s not just Vintage any more! Nice to have this for a more accessible format? [+] comixology:That time Tony Stark and Gamora hooked up? Tony Tony Tony? [+]christowitch: Dungeons and Dragons tshirt design I made. Im gonna get it made eventually lol. 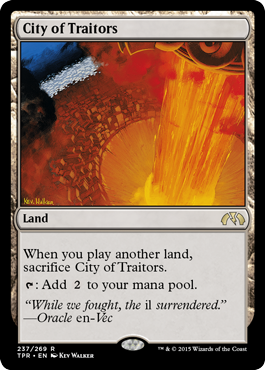 new tezzeret or new tamiyo? [+]cardboard-crack:My new comic collection is available both on my site and on Amazon. Please check it out! [+] I just got a B-Day cupcake from Tumblr�!This was a great year.� Hopefully I?m alive for another on Tumblr.